It would be brilliant if the Dragon Chronophage could have a similar effect on one of the major Shanghai universities, such as Jiao Tong University. On March 27–30 2015, Dr John C Taylor OBE FREng will showcase his Dragon Chronophage clock at Design Shanghai, China’s premier design event, at the Shanghai Exhibition Centre. The clock will be on sale at the event and its presence in Shanghai reinforces the city’s link with the renowned university city, Cambridge. The Corpus Chronophage, the first clock of its kind and predecessor to the Dragon Chronophage, is displayed in an exterior wall of Corpus Christi College, Cambridge. Dr Taylor donated it to Corpus Christi, his alma mater, in 2008, and as a consequence the clock will be seen, in the future, as a part of the university’s rich history. The University of Cambridge, founded in 1209, is the UK’s second oldest university. Jiao Tong University, founded in 1896 as Nanyang Public School, is China’s second oldest institute of higher learning, and like Cambridge, is one of its country’s most prestigious universities. Dr Taylor, speaking about the donation of the Corpus Chronophage, said, “When I donated the Corpus Chronophage to my old college, I could not have imagined the response that it got. “Overnight, it became Cambridge’s most popular tourist attraction, eclipsing the world famous King’s College Chapel and making Corpus Christi College even more prestigious and in demand with students. Dr Taylor knows China well, having done business in Hong Kong in the 1960s and having set up a factory in Guangzhou, Guangdong Province in the 1980s. 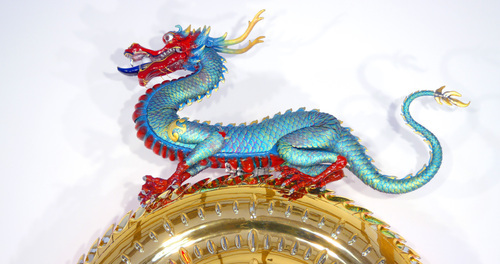 The Dragon Chronophage was designed in tandem with one of China’s leading authorities on art: Professor Long of the China Academy of Art, Hangzhou. As an authentically Chinese piece of art, it will complement Shanghai in the same way that the Corpus Chronophage complements Cambridge. The clock, a homage to the brilliance of Chinese design, is valued at over £3 million (around RMB29 million), making it one of the world’s most valuable modern clocks. The popularity of the Corpus Chronophage as a public piece of art shows the appeal of these unique timepieces. Soon the Dragon Chronophage will also be performing to fascinated crowds at Design Shanghai. The Dragon Chronophage (Ancient Greek for ‘time eater’) is designed to make reference to Einstein’s theory of ‘relative time’ and speeds up, slows down and even stops, reflecting the fact that our perception of time can change depending on our activity. The clock is correct every fifth minute. The clock externalises the ‘grasshopper escapement’ developed by the groundbreaking eighteenth-century English clockmaker John Harrison; it aims to increase public awareness of the importance of the ‘grasshopper’ and other pioneering Harrison inventions to humanity as a whole. The Dragon Chronophage is the third that Dr Taylor has created, and is a homage to the brilliance of Chinese design. China has always been special to Dr Taylor, who first visited Hong Kong on business in the 1960s and set up a factory in Guangzhou in Guangdong Province in the 1980s. As one of the world’s leading inventors, he appreciated the enthusiasm for design that it seems is part of the Chinese DNA. Dr Taylor has also conducted a lot of research in the subject of horology. 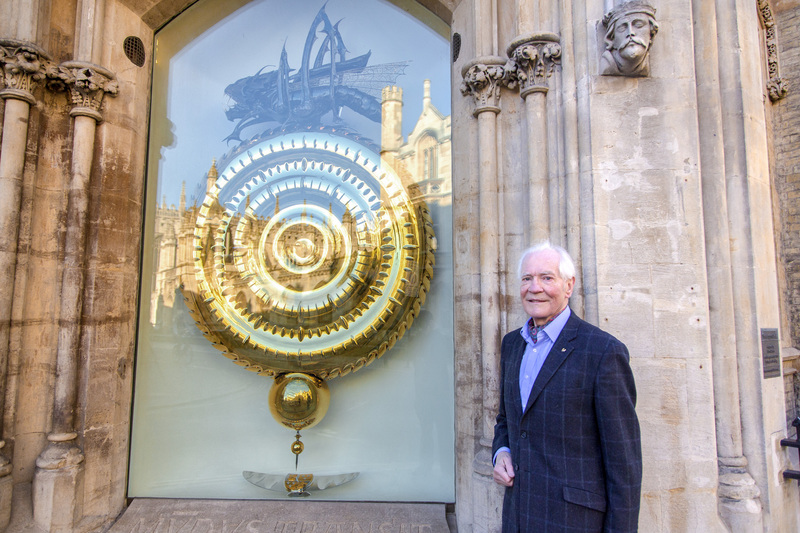 His admiration of John Harrison, an early pioneer of clocks and time-keeping, led him to design and help build the Corpus Chronophage, a three metre-high clock that lives on the exterior of the Corpus Christi College building at Cambridge University. Dr Taylor is on Twitter at https://twitter.com/DrJCTOBE. Media information provided by Famous Publicity. For further information please contact George Murdoch on 07834 643 977 or email george@famouspublicity.com or contact Tina Fotherby on 07703 409 622 or email tinafotherby@famouspublicity.com. Design Shanghai is China’s leading international design event. In 2014, Design Shanghai opened its doors to over 47,000 visitors, breaking new ground and setting a precedent in China’s ever-growing design community. Showcasing the best design brands from across the globe, Design Shanghai provides a unique and exciting platform to network and establish long-term business relations with China’s top architects, interior designers, property developers, facilities managers, private buyers and anyone with passion for exciting, new and inspiring designs. 2015 will see the return of China’s premier design event, featuring even more of the finest international design houses, inspiring speakers and curated features. Founded ten years ago Media 10 Limited is the most decorated media and events company in the UK. Media 10 Ltd has fast become one of the leading players in the media and events industry as a result of running some of the most iconic and successful magazines and events in the country, including Grand Designs magazine, Icon magazine, Grand Designs Live and the world’s oldest consumer exhibition: The Ideal Home Show. Other events in Media 10’s portfolio include 100% Design, 100% Optical, Britain and Ireland’s Next Top Model Live, Clerkenwell Design Week, The London Design Trail, Grand Designs Awards, Icon Awards, Destination Star Trek and Coronation Festival at Buckingham Palace. As a privately-owned company based in Loughton, Essex, Media 10 employs over 200 talented people to run a growing portfolio of 17 live events, 21 websites and seven magazines. In the ten years the company has been running, the company has seen its turnover, profits, portfolio and staff numbers grow at a dramatic rate and it now has over one million visitors in attendance at Media 10 events and its publications have over three million readers.